We are delighted to be taking an important step towards addressing affordability, an issue on which NYU has placed great emphasis. With Veterans Day approaching, New York University’s Stern School of Business is announcing a $15 million endowment gift from alumnus Lorenzo Fertitta (MBA ’93) and brother Frank J. Fertitta III to create a new program exclusively for U.S. military veteran and active duty students who will be entering the School’s full-time MBA program next year. The School projects that approximately 20 incoming full-time MBA military students who are accepted into the Fertitta Veterans Program will receive scholarship support that reduces their tuition to a flat $30,000 per year. Students who qualify for veteran benefits, including Yellow Ribbon funding, will continue to be eligible to receive those benefits. In addition to the scholarship money, the program will provide academic and professional support customized for veterans to ease the transition from the military to business school and eventually the business world. The Fertitta Veterans Program, believed to be the only program of its kind at a U.S. business school, will begin in summer 2017 for members of the full-time MBA Class of 2019. The uniquely designed summer session will include an early start on selected coursework; career programming with access to corporations and alumni; engagement with veteran alumni mentors; and social activities. At the conclusion of the summer session, veterans will be fully integrated into the Full-time MBA program beginning with LAUNCH, Stern’s week-long MBA orientation. "We are proud that we are able to launch this program. Our veterans are a greatly valued group among the faculty, their fellow students and employers. 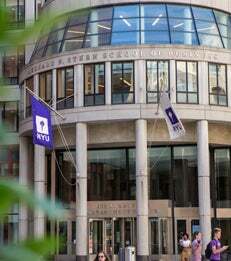 We are delighted to be taking an important step towards addressing affordability, an issue on which NYU has placed great emphasis," said Raghu Sundaram, vice dean of MBA programs. “My brother Frank and I have always been committed to assisting those who have proudly served our country and hope our gift encourages many of our military veterans to earn their MBA from my alma mater,” said Lorenzo Fertitta. This endowment builds on a strong foundation of current support offered to military students at Stern through both scholarships and community. Stern’s Military Veterans Club is an active and tight-knit community of MBA student support. This fall Stern enrolled the highest number of incoming military students to its full-time MBA program on record. The Fertitta family’s support for the military also extends to a variety of local and national military charities personally, and through their ownership of Station Casinos and their former ownership of the Ultimate Fighting Championship. Military-based charities that have benefited include: Veterans Village, housing and services for homeless veterans; the Fisher House Foundation; Nevada Military Support Alliance; the Intrepid Fallen Heroes Fund; and the Wounded Warriors Project.